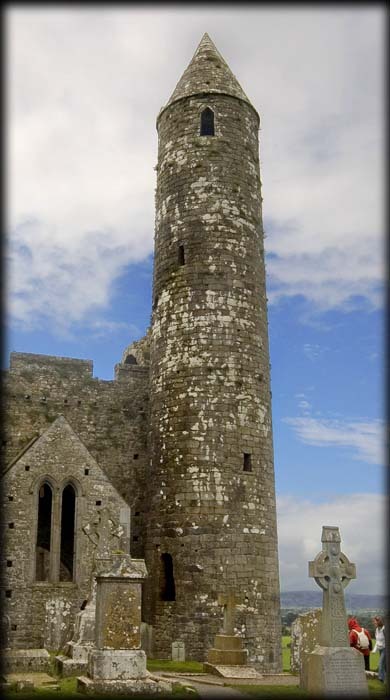 The Rock of Cashel is one of Ireland's most dramatically situated ecclesiastical sites. This fabulous monument certainly has the "WOW" factor. The stunning collection of architectural monuments is simply outstanding. It's not often that a round tower is not the most dominating structure at an ecclesiastical site. The 27.9 metre high tower is located next to the north transept of the 13th century Gothic Cathedral. The tower is constructed of coursed sandstone with limestone in the lower courses. It has a diameter of 5.33 at the base. The monument was restored by the O.P.W in 1874-75 and looks in superb condition. 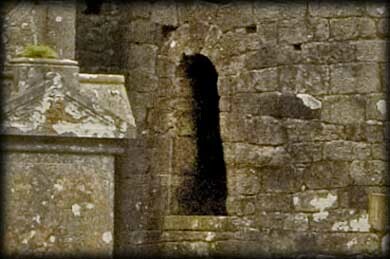 The original south-east facing round-headed doorway is situated 3.28 metres above ground level. It was probably facing the the original medieval church that was replaced by the Gothic Cathedral in 13th century. There is a second doorway located in the west of the tower that gives access from the Cathedral via a connecting triforium passageway. There are four angled windows in the belfry slightly off the four cardinal points. The three windows in the drum are lintelled. Also present on the Rock is the Gothic Cathedral, The superb romanesque Cormacs Chapel with it's two rectangular towers. In the grounds is a replica of St Patrick's 12th century High Cross, the original is on display inside the visitor centre. Inside the chapel is a Sarcophagus decorated in the Urnes Style. Hore Abbey is situated to the south-west and can be viewed from the Rock. Situated: This site could not be easier, from Dublin head south on the N8 to Cashel, Tipperary. The Rock of Cashel totally dominates the town and cannot be missed. Discovery Map 66: S 0745 4098. Last visit Sept 2009. Dimensions: Height 27.94 m. Diameter: 5.33 m.
Door: Above ground 3.28m. Type: Arched. Windows: Seven. 4 angled belfry windows. 3 lintelled. Features: Second door added later.